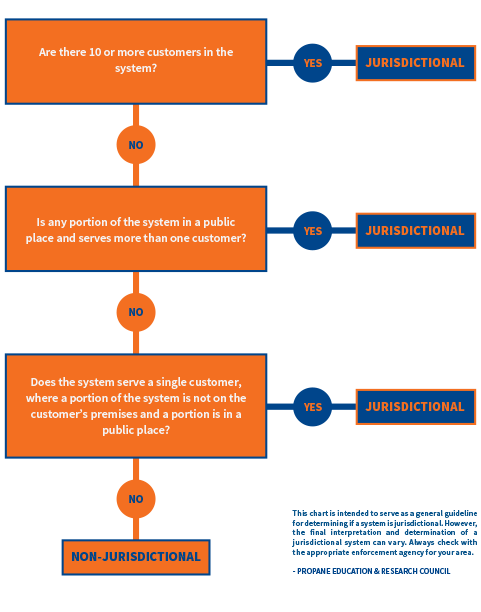 WHAT IS A JURISDICTIONAL SYSTEM? A system of pipes serving 10 or more customers by a single tank or propane service. A system of pipes serving two or more customers by a single tank or propane source within a public place. A public place is generally open to all persons in a community such as churches, schools, commercial buildings, and shopping malls. A single home tank where any portion of the system is located in a public place. Some jurisdictional systems are served by a master meter, which is a pipeline system for distributing gas typically found in condominium associations, mobile home parks, apartment complexes, or housing projects. Jurisdiction ends at the outlet swivel of the meter or the connection to the customer’s piping, whichever is further downstream. A propane system is considered non-jurisdictional if it has fewer than 10 customers and no portion of the system is located in a public place. Title 49 of the Code of Federal Regulations (CFR). Special regulations for propane gas systems are contained in Parts 191 and 192 of 49 CFR. NFPA 58 and NFPA 59, which apply to all propane operations who install, deliver, and maintain. The federal government is primarily responsible for developing, issuing, and enforcing pipeline safety regulations. Many states have partnered with the federal government to provide enforcement through state agencies, who develop and implement additional regulations that are incorporated in to their state’s Gas Safety Rules. Jurisdictional system regulations have associated requirements that affect system installation, personnel training, system maintenance, and incident response. Have more questions? Contact us to learn more about Duty to Warn and jurisdictional propane systems.